I forgot to post this from my recent trip to Forks this year. I was looking for souveniers that were not cheesy, overpriced and mass produced. 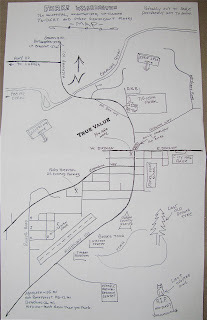 I stopped at an Ace Hardware in Forks, and this is their "Un-official, Un-authorized, Unclaimed" map of the city. It actually is pretty accurate for the town. Thought you might enjoy. Click photo for larger detail. this is so cool :) and also funny. Wait, so did they draw this for you? Or did they have copies of it? This is fantastic. I love that they have Dr. Cullen's parking spot marked, too. haha @ Mexico - much closer than you think. That is REALLY neat! Did someone DRAW it for you or were there copies just kinda laying around at the Ace? You should have grabbed a BUNCH! hehe!